All victories in the major championships are special but for Jack Nicklaus winning at the Old Course at St. Andrews was one to savor. Jack Nicklaus’ long-time idol Bob Jones once said that no career is complete until a golfer has won on the Old Course at St. Andrews in Scotland. That sentiment rested in the back of the golden bear’s mind as he came to the Old Course for the 1970 British Open, having not won a major championship in three years. 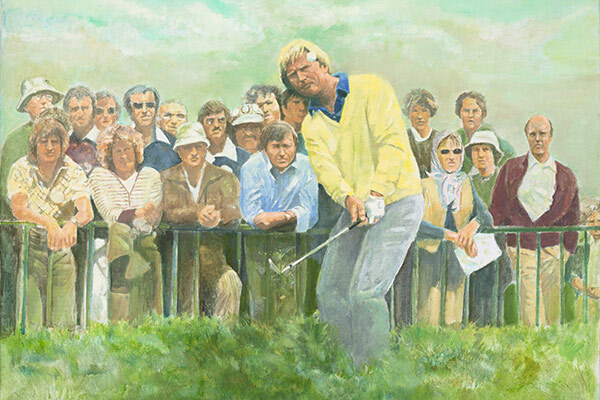 Inspired by the memory of his father, who had passed away a few months earlier in 1970, along with his love and understanding of the game’s history, the prospect of winning at the Old Course surely added just that much more motivation for Nicklaus. He opened with rounds of 68-69-73 to go into the final round tied with Doug Sanders and Tony Jacklin for second place, two strokes behind Lee Trevino, who was masterful in the windy conditions. For a time, it looked as though the championship was Sanders’ for the taking. Playing in the group behind Nicklaus, he had a three-footer on the final hole for the win, but backed away and never really seemed to settle himself. He missed the putt and the 18-hole playoff was set for the next day. With five holes left to play, Nicklaus led by four strokes but Sanders picked up three strokes through no. 16. both players parred the road hole. Sanders hit a fine drive on 18 and in a moment of high drama, Nicklaus peeled off his sweater before he smashed a drive of some 370 yards through the green. He then two-putted for his birdie and his second British Open victory – uncharacteristically tossing the putter in the air in celebration. In the interview room minutes later, Nicklaus was asked about his 10th major championship victory and pulling within three of Bob Jones’ record. The golden bear confessed that until that moment, he had never even considered the championship total and the record now in his sights.